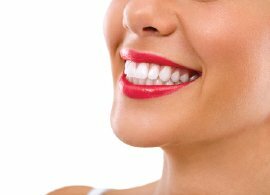 Teeth whitening is one of our most popular cosmetic dental treatments here at AP Smilecare and it’s not hard to see why. With teeth yellowing with age and delicious food and drinks like tea, coffee, wine, curries and berries playing havoc with the colour of our teeth, everyone’s teeth become discoloured over time. While some individuals may just embrace the change, to some, the impact of yellowing, discoloured teeth can have a big impact on their confidence. We all want to look our best and feel self-assured, so sometimes, simple things like getting your teeth whitened can finally give you that self-confidence you’ve been look for. But what actually happens when you have your teeth whitened? And realistically, what are the results like? We’ll explore all this and more in today’s blog. Teeth whitening is a process that involves bleaching your teeth to make them lighter in colour by several shades. Your teeth won’t necessarily come out bright white after the treatment but they will look noticeably lighter. Your consultant should be able to give you a good indication of the result you’ll get after looking at your teeth and discussing your requirements. The whitening process is typically carried out using hydrogen peroxide in gel form. The chemical gives off oxygen free radicals, which break down the colour molecules that are staining the teeth, turning them into much smaller molecules that are far less noticeable. This in turn helps to restore teeth to their natural colour. At AP Smilecare we put the hydrogen peroxide gel formula into custom made dental trays, made to fit your teeth. We also use a combination of peroxides to maximise your teeth’s whiteness in the shortest time possible. This process is repeated daily for between 1-4 hours, depending on the treatment we have recommended for your teeth. You will usually see a difference in the colour of your teeth after a few weeks. It takes a minimum of 10-14 days to get the full effect. This process does yield great, long lasting results though. Once your teeth have been whitened, it’s important that you continue to look after them properly to prevent them from becoming discoloured or stained again. My local spa does teeth whitening and I’ve seen some great products on the high street, so why should I choose a dentist? It’s important that you visit an experienced dentist who can assess the health of your teeth and gums before the treatment. Done wrongly, teeth whitening can damage the teeth, lips and gums. Our products are tailored to your teeth, from the formulation right through to the custom made trays. The combination of peroxides we use are also far superior to anything you’ll find in spas or on the high street. What options do you have available? To find out more about either of these packages, or to book a consultation to discuss teeth whitening, give us a call on 01254 297 000 or pop into our practice located in Blackburn.